A perspective on the transfer fees at today's valuation was finally provided and it will raise eyebrows. 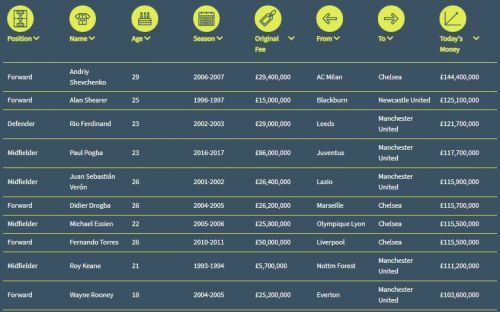 A study published by TotallyMoney evaluates what would most Premier League transfers cost today. This study takes into account all transfers since the league's inception. Who's the most Expensive ever? Surprised? We were too. What would you say about the strength of this team? 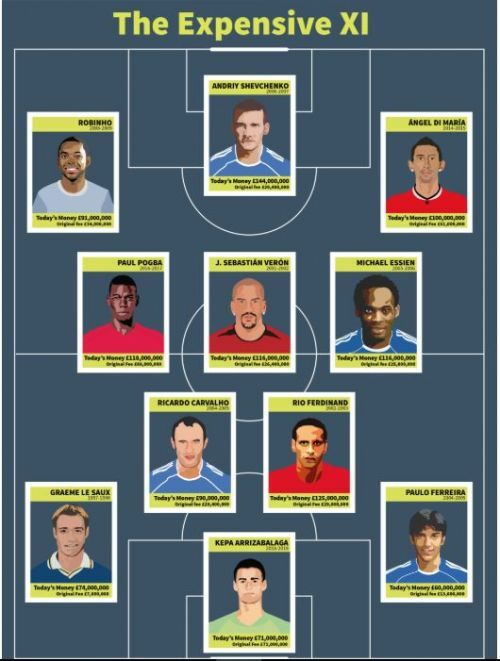 Probably not the best team when compared to All-time Premier League XI from BBC. An interactive table gives the list of the transfer fees in today's money for all the transfers in the Premier League. Find out about the players from your club. Only Paul Pogba is in the Top 10 who still plays in the Premier League. It begs the question why would someone go through this exhaustive exercise. What point are they trying to make? The primary reason that TotallyMoney says is what the footballing world has been debating. Do high fees for today's players make them more valuable than those from yesteryears? Now with the valuation aspect in perspective, a comparison is possible. We looked at all Premier League transfers from the beginning of the Premier League to the latest transfer window. Each year we find the average price paid for a Premier League player. The year on year change to this figure gives us a football transfer. This gives us the ability to compare the money spent on a player across Premier League history. In the 1994-1995 season when Blackburn Rovers won the title the average player cost £1,160,000. By 2012-2013 when in his final season Sir Alex Ferguson won the Premier League. The price paid for an average player had rocketed to £5,370,000. Almost a 5 times increase in price. This shows that football inflation far outstrips everyday inflation. TotallyMoney used data from Transfermarkt and XE Currency Converter to calculate the what they call Todays Money, that is the transfer fee accounted for Football Inflation. The article, however, does not go into why exactly Football Inflation is so high! There are multiple reasons. 1. More money is coming into football from various sources like TV, Advertising, Partnerships etc. 2. Football has become truly global. Since there are fan bases in many countries there are as many sources of revenue and this footprint continues to expand. 3. Inflation itself is a contributing factor. 4. Clubs are now publicly listed so share prices matter and hence staying on top matters, which results in overpaying to stay competitive and get ahead. There may be multiple other factors if we dive deep into it. For now, this study gives rest to the argument that player "X" 10-20 years ago would be worth more than player "Y" now. You can see what would each cost and bring some sense to the argument.